Amy Murk of Memphis, Tennessee, was running late to a job interview one morning when she was pulled over for going nine miles per hour over the speed limit. She was issued a traffic ticket for $47.75, but was unable to pay her fee because she was recently laid off from her job. Because she failed to pay her court costs, a judge sentenced her to two days in jail. Additionally, multiple fines were tacked on to her sentence, making it almost impossible for her to catch up with her payments. Murk, a single mother of three, disputed the criminal penalty sentenced against her but received little mercy from the court system. Though debtors’ prisons were abolished two centuries ago, Murk is just one of many people across the country who has served jail time for being unable to pay a fine. A recent study done by the Population Reference Bureau reports thousands of Americans are given jail time each year because they cannot afford to pay for traffic tickets, court fees and medical bills. The issue was also raised by a federal government investigation into the shooting and riots that broke out in Ferguson, Missouri, in the fall of 2014. On March 4, 2015, the Department of Justice issued a scathing report about the city and its use of court fines to finance city government at the expense of residents, especially the African-American community. “I don’t think we treat poor (people or minorities) any better in Memphis than they do in Ferguson, just in this instance we’re not doing it as brazenly. We have found other ways to subject them to this system,” said Josh Spickler, of the public defender’s office in Shelby County. Nationwide, according to Michelle Alexander, author of The New Jim Crow, “many states utilize “poverty penalties”—piling on additional late fees, payment plan fees, and interest when individuals are unable to pay all their debts at once, often enriching private debt collectors in the process.” Other fees can be added to an offender’s court cost, sometimes tripling the original amount. In Shelby County, one must pay a $25 start-up fee to be placed on a payment plan, according to the Tennessee Bureau of Investigation. Spickler said not all criminal court fees are a set amount, and the clerk of the court is able to set the fee in these occasions. 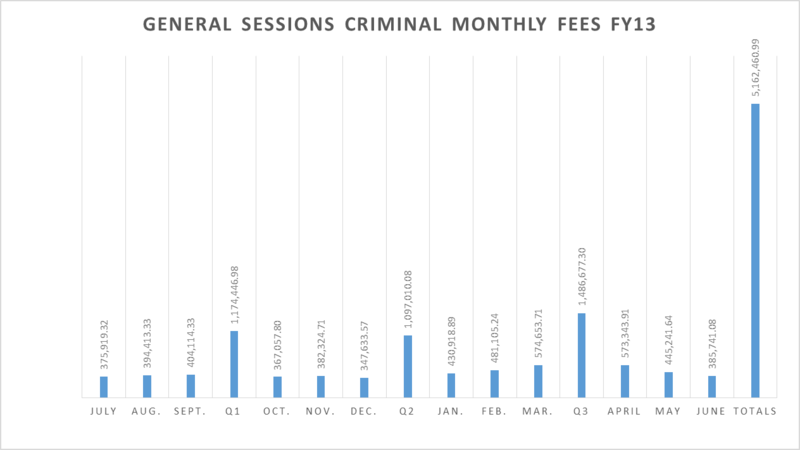 In 2013, the Shelby County Criminal Court reported collecting $3.2 million in fees. April brought in the most revenue of any single month, with a collection of $339,000. Revenue generated from collected fees is used to pay for anything from background checks to renovations of public buildings, according to the Tennessee Bureau of Investigation. Leftover revenue is stored in a general fund account each year. Murk said it is nearly impossible to make ends meet and pay off the remaining amount she owes on low-wage pay and having children to support. Jacob Sammons, an accounting major at the University of Memphis, was on the way home from a friend’s house when he noticed flashing blue lights in the rear view mirror of his Toyota Camry. When he pulled over, a patrolman issued him a ticket for $233 for driving 20 miles per hour over the speed limit. “I admit that I should not have been driving that fast, but that is a lot of money for a college student,” Sammons, 20, said. Sammons took the case to court in hopes to remove the ticket from his record. In the end, his ticket was thrown out and he did not have to attend driving school, which was part of the original agreement. Though Sammons thought he was in the clear, a week later he received a letter stating he owed $50 to a public defender along with a court cost of $90. A study conducted by the city court clerk’s office reported the city of Memphis charged offenders $20 million it didn’t receive in 2011. Some people are concerned that the uncollected dollars stem from citizens’ inability to pay. In October of 2014, Memphian Christal Lyons found herself at the wrong place at the wrong time. She accompanied someone to a grocery store, but she was unaware her friend had an intention to steal while they were there. While walking out of the store, a loss-prevention officer pulled them both into an office and requested to search their bags. Though Lyons’ bag contained no stolen merchandise, she was given a citation that was equally as heavy as her friend’s: theft of property under $500. Lyons and her friend hired a lawyer, and along with a public defender’s help, a settlement was reached for the pair. Because her friend pleaded guilty and agreed to a year of probation, Lyons was not faced with any charges. But if Lyons decided to not have the charges dropped, she would be paying $40 a month for the probation officer, additional court fees and a $450 expungement fee at the end of her probation. Lyons said she does not know if she will be able to pay off her fees before the deadline, and is uneasy about her payment plan because it tacks on an additional cost to her already high court fees. But high court fees are not the only problem one has to worry about in the city of Memphis. If traffic and court fees are not paid, defendants can have their license suspended. It is not just in Shelby County where the court fees are putting a burden on people. Even smaller counties, such as neighboring Tipton County, in western Tennessee, have the same issues. Faye said if a defendant asks for additional time in Tipton or Shelby County, he or she can have up to 90 days to pay off a traffic ticket and up to one year to pay off any court costs. Travis Malone, a 19 year-old Pizza Hut employee from Southaven, Mississippi, found himself shelling out thousands of dollars to hire a defense attorney after he was busted for having a quarter of an ounce of marijuana in his vehicle. Along with his attorney, Malone decided to fight his charges, which only led to increased fees and a suspension of his license. “It all happened so fast and I fell into a hole quick,” he said. Malone now faces over $5,000 in court costs, though the maximum sentence for misdemeanor possession of marijuana is only $1,000 and one year in jail for first-time offenders. Advocacy groups around the country, including the Brennan Center for Justice at New York University Law School, are working to halt the increase of court fees and fines . As for Murk, who is still paying off what she owes to the court two years later, she said she doesn’t expect new debtors’ prisons to disappear anytime soon.